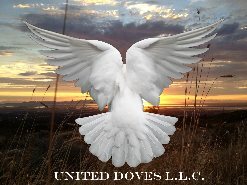 The United Doves are the foundation of our business. A great deal of time, energy, and talent goes into training every member of our flying team. The ceremonial doves that we use are living animals. Because the care and safety of our birds is one of our top priorities, we must follow policies that will keep our team out of harm's way before and after the doves are released and that will enable them to return home safely. We will NOT release the Doves at night without prior arrangements made. See our FAQs for more details. We will NOT release the birds in inclement weather (decisions about safe weather are at the sole discretion of the dove-handler). We usually allow only our trained handlers to handle the doves; however, our handlers will allow a client to safely release the birds with assistance. We will always dress appropriately for the occasion. We will always provide at least one coordinator at your event, unless prior arrangements are made. Some events occasionally may require 2-3 handlers, depending on how many birds will be liberated. We cannot guarantee any specific performance from our birds once they are released. Typically, our birds circle the area a few times, and then head to their destination. We are NOT responsible for soiling of any clothing (this has never happened). We release white rock doves only, otherwise known as "proven" white racing homing pigeons. Trained professionals release rock doves only, knowing there is a huge difference between a "love dove" that can be purchased from a pet store and a true white "racing" homing pigeon. We offer a 100% refund if the doves that are scheduled to fly do not fly due to bad weather within each franchisee's personal service area. If the release is beyond our service area, the out-of-service-area fee is non-refundable. No refunds are given on orders placed online with our Express option. The option is non-refundable. Please note: If you purchase a dove display for the $150 price, and request to have 2 additional doves released from a heart shaped basket for the additional $50 dollar fee, in the event that the 2 doves cannot be released due to inclement weather, we will only refund the $50 dollars it cost for this additional option. We are paid for our time when we do a display package at a wedding, this is non -refundable regardless of whether the birds will be able to be liberated or not. (Please be sure to specify which package you are requesting, and the service you desire. We comply with the actual written contract that is sent to us and agreed upon at the time of the booking, not by email correspondence. We appreciate your compliance on this matter). We will not refund deposits if you cancel less than 14 days prior to event. The dates are reserved on a first come, first serve deposit basis. We can perform as many as 4 different releases on any given day, so we must have at least 14 days prior notice of cancellation in order to schedule our releases efficiently and best serve all of our clients. All orders processed through our Online/Express option are final and non-refundable. Please allow 2-3 days for delivery. We sent Mon-Wed of each week. Please click here to calculate 'sundown' in your area.